Building on 30 years of mass notification and voice alarm experience the IDA8C is a third generation modular system offering IP and/or fiber optics networking capabilities	along with full NFPA 2010 compliance and EN54-16 certification. System design and set up is done via a drag n' drop digital signal processing (DSP)	interface offering an industry standard component library with advanced matrix	control functions. The front panel features a high resolution TFT panel for control	and monitoring, a fully monitored fireman's microphone, and emergency message trigger buttons. The IDA8 offers full monitoring of the entire systems integrity including amplifier monitoring with automatic hot-swap to back-up amplifiers and loudspeaker line monitoring. Each IDA8 can support up to eight audio inputs and features 16 line outputs supporting 8 different zones with class B wiring and A/B line detection (as specified in EN54-16). In addition to the front panel mounted fireman's phone, up to four PSS security microphone consoles with color touch pad can be connected to each IDA8. Slave units (IDA8S) can extend the system configuration with an additional 8 inputs and 8 class B outputs with A/B line detection or single zone line monitoring. A built in message storage chip can contain a maximum of 4 hours of digital messages that can be recorded live into the unit or be uploaded (WAV) from a computer. Up to 8 messages per IDA8 unit and a total of 64 messages for each IDA8 system can be played simultaneously into different zones. Operators can see a detailed overview of the status of the entire PA-system with a single push of a button. IDA8 is able to run an impedance scan of all components connected to it, covering not only the paging consoles but also connectors, cabling, internal processing blocks such as compressors and limiters, as well as the network and loudspeaker lines. It stores a reference measurement of the system as it exists in a given configuration and environment. This reference is subsequently stored in the system. Any alterations towards this reference will be reported and logged in an event-log-file. User definable thresholds can be applied to these references allowing for customization of the system's supervision for specific use. All components and peripherals are monitored. All incidents are recorded into a data file which can be accessed on the master module monitor display or remotely on a PC using the control software. Any detected faults are also routed to a general fault output contact on the	master unit. A built-in loudspeaker output enables selective listening to all the sources and system's 100 V output signals. Once programmed, the system will be able to work independently (off-line) without the need for a PC. 8 analogue audio outputs + 2 for back-up amplifiers with selectable 18 or 20 kHz monitoring signal for end-off-line monitoring or, using defined monitoring windows, individual monitoring with an accuracy of up to 5% of the total line load. 8 line level analogue audio inputs with an optional 8 microphone/line input card. 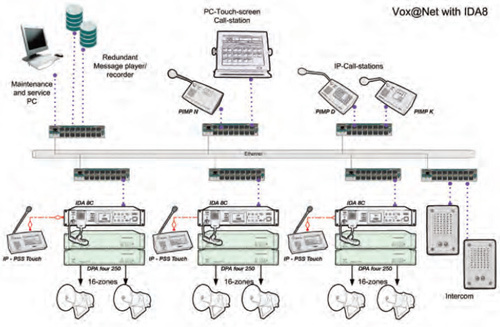 Optional TCP/IP audio break in and out boxes, TCP/IP call stations, etc. Redundant local network cabling over RJ45 (300') or fiber optic (4K'). LOCAL Network: The system is designed to handle up to 256 priorities and can be configured for up to 256 zones in the LOCAL Network. GLOBAL Network: Up to 32 Local Networks can be connected to a Global Network allowing a system configuration of up to 32 x 256 zones. Front panel color touch-screen display for control and monitoring and push buttons for emergency operation. Internal message storage with a capacity of up to 4 hours of WAV format audio files. The message player and messages are monitored. Full monitoring starting at the capsule of a call station microphone to the end of the loudspeaker line. The external cables connected to the control inputs are monitored for short and open circuit. Standard test, alarm and chime-tones are stored in the Master and Slave unit(s). Extensive audio pre- and post processing possibilities for audio inputs and audio outputs. Our IDA8 systems for Public Address and Voice-Alarm are complying with EN 54-16 and are combining full flexibility with state of the art functionality. A true example of how modern technology combines with years of field experience. All installations requiring the integration of public address and voice alarm can use an IDA8 system. The following examples offer an overview of a proposed system architecture in three different environments. © 2019 Penton Audio USA. All Rights Reserved.